Americans believe that the Soviet Union was an ally in the war against Nazi Germany in the 1940’s; and that was true at the end of the war. What few people know, was that Russia and Germany both were operating as allies under a signed pact when the war started. The two armies attacked Poland from the East and the West and both forces established death camps for the Jews and other minorities when it all began. The details of this incredible story are revealed in the book “Devil’s Alliance: Hitler’s Pact With Stalin, 1939-1941” by historian Roger Moorhouse. That “non-aggression” pact, signed by Joachim von Ribbentrop, Germany’s foreign minister, and Vyacheslav Molotov, foreign minister of the Soviet Union on August 23, 1939, was a promise by Hitler and Stalin not to interfere in the event the other nation went to war. According to Moorhouse, the two agents also signed a second agreement that carved up Eastern Europe between them. In other words, both Hitler and Stalin were collaborating in plans to invade the surrounding European nations and split up the spoils after the shooting ended. The twin agreements were all that the two dictators needed before they launched World War II. Nine days after the signing, on September 1, Hitler invaded Poland. Britain and France declared war on Germany, and the fighting was underway. The Soviet Red Army attacked Poland from the East on September 17 and the Polish army evacuated to nearby Romania. The Russians then followed up on their attack and soon occupied Romania, Estonia, Latvia, Lithuania and Bessarabia. Within weeks, Germany annexed Western Poland and the Soviet Union incorporated its newly seized areas into part of the Soviet Union. Moorhouse said the Soviets occupied its new territories in remarkably similar ways to the Nazis. Thousands of Jews, Romanians, Polish Army officers and public officials were executed or deported to gulags and concentration camps. He wrote that the Jews were left confused by what was happening. Many fled from Germany into Russia hoping to escape persecution, while others fled into Germany for the same reason. Others just left the country. For a brief while Nazi Germany and the Soviets cooperated economically, exchanging raw materials and finished products. The agreement between the two dictators fell apart in 1940 after the Soviets made an unsuccessful attempt to invade Finland and took a brutal loss in what was remembered as a “winter war.” Hitler reasoned that if the Soviet Red Army couldn’t claim an easy victory over the Fins, it probably couldn’t stand up against the Nazis. Instead of invading England as he had planned that year, he turned his troops on Russia. 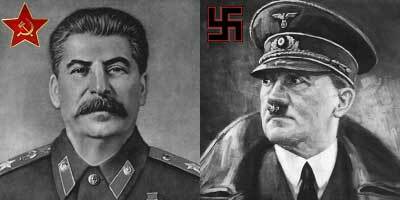 At first, Moorhouse wrote, Stalin was stunned by what Hitler was doing. After taking terrible losses during the first months of the war, the Red Army got organized and began driving the German’s back. This was how Stalin joined Allied forces in the war against Germany. It was never planned. British and American historians tended to “airbrush” the Nazi-Soviet Pact” out of our history books. Thus we have maintained a strange feeling of allegiance with the Russians, even though many U.S. generals disagreed with President Truman at the end of the war, arguing that they believed the U.S. should invade the Soviet Union after Germany surrendered. There was no love lost between the Soviets and the United States. The strain continued on throughout the Cold War years and tensions have only eased in recent years. Had Hitler maintained his pact with Russia and invaded England as planned in 1940, his forces may have been occupying all of the British Isles by the time the U. S. entered the war the following year. With Rommel’s forces occupying North Africa and the Nazi’s and Soviets united and controlling most of the rest of the European and Asian continent, any invasion by American forces would have had to have been made by sea. Such a war may have had a much different outcome.